If I tell you that Nocturnal Animals is about an art gallery owner and a novelist, that might be a lure – as it was for me. If I then add that it is a first rate production on all counts, your mind will be made up, right? But what if I add – from some weird sense of honor – that it is possibly the most violent movie I’ve ever seen. The violence is both physical and emotional, a combination that gains its hypnotic power from the high quality of the script, direction, acting, and the atmosphere. If Nocturnal Animals sounds like an odd title, not so. The good guys are victimized by the bad guys in the barren wastes of Texas scrub. Both location and mood from beginning to end are heavy and dark, the happenings just plain grim. All of this is done so well that we are right up there in the story and director Tom Ford never lets us go. After a bizarre series of opening scenes grabs our attention, we meet Susan (Amy Adams), an art gallery owner who is facing the unhappiness of life with her second husband (Armie Hammer). Twenty years earlier, she had left first husband Edward (Jake Gyllenhaal) after telling him he was too weak to become the writer he wanted to be. Now, like a shot in the dark, Susan receives a novel written and dedicated to her by Edward, the first. Prepare yourself. From that minute forward, the movie alternates between Susan’s reading of the novel and director Ford’s filming of what she is reading. That combination adds up to an unimaginably vicious form of vengeance. The more she reads, the more terrible it gets. It was at this point that I began to wonder who possibly had the imagination to devise this complex exercise in malice. Tom Ford, of course. He wrote the script and directed the film. The central performance that gives reality to the mayhem comes from Jake Gyllenhaal. Completely convincing as the discarded husband and as the author of the novel, he is the backbone of the film. Prolonged and villainous performances by Aaron Taylor Johnson and Kar Glusman will leave you speechless. After the core horror, Tony enlists Bobby, a quirky lawman to help him track the guilty men. Appropriately for this movie Michael Shannon makes this lawman anything but the kind, understanding hero we want him to be. Be warned that the revenge exacted by the ex-husband on his wife may be beyond anything you want to see. 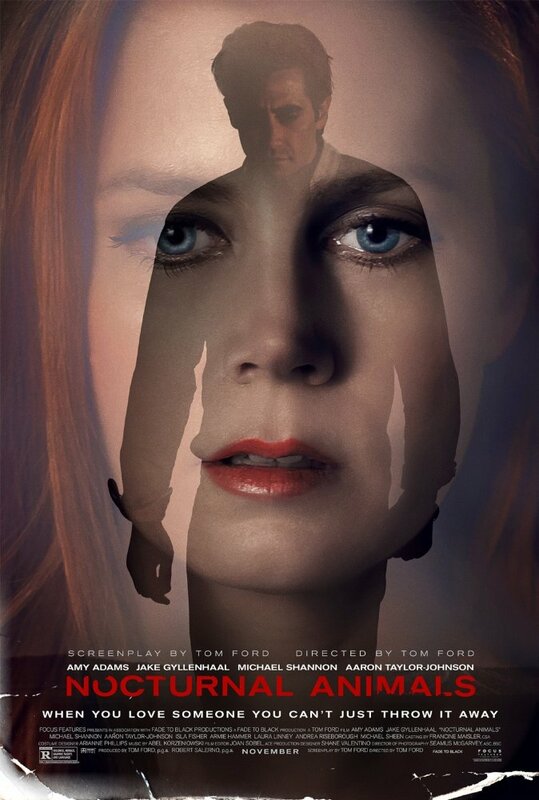 But if you love a good thriller, rest assured that master craftsman Tom Ford has made one of the best. As you watch this wicked tale unfold, ask yourself how Ford could have imagined, scripted, and directed anything as horrific and spellbinding as this. A gentle suggestion, park your car near the theater. You won’t want a long walk in the dark after this one. This review was posted on November 26, 2016, in Drama, Thriller. Bookmark the permalink.